Published in Astronomer's Telegram No.2670. Classical nova V458 Vul (N Vul 2007 No.1) was detected as a supersoft X-ray source by the Swift XRT (ATel#1246, #1603). This star is interesting with its spectral class change: features of Fe II class nova completely changed by features of He/N class in the SSS phase (T.N. Tarasova, IBVS #5807). 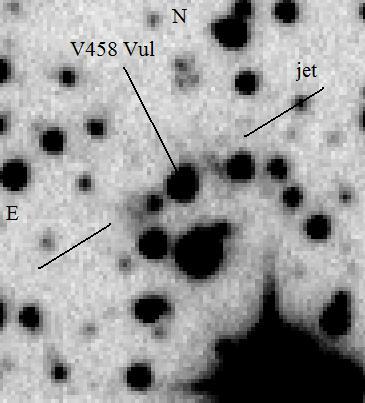 We performed spectral observations of V458 Vul with the Russian 6-m telescope BTA and spectral camera SCORPIO on 2010 June 9.84 UT. The exposure was 1200 s. The spectrum was taken in the long-slit mode with the resolution FWHM 15 A in the wavelength range 3100-7300 A. The position angle of the slit was 135 degrees. In such position, bright knots of nebulosity are visible in the slit in the monochromatic light of different spectral lines at both sides from the stellar spectrum at the distance of 3".6 to NW and 4".3 to SE from the star. The SE knots are brighter in all the lines. There are also faint knots seen in some lines, and scattered radiation. In Balmer lines, the structure expands by 27".5 along the slit. In addition to Balmer lines, we identified nebulosity in He II 4686 A, [O I] 6300 and 6363 A, [O II] 7319 A, [O III] 4958, 5006 A, N I 6708, 6723 A, [N II] 5754, 6548, 6583 A, and N IV 7129 A. Fig. 1. Fragments of direct BTA/SCORPIO image and spectrum taken on 2010 June 9. In the image, the location of slit is shown by vertical line. On the next night, we have taken direct CCD images of V458 Vul with UBVR_c filters with the SAO 1-m Zeiss reflector. The seeing was 1".4. In the R band frame taken in June 10.92 UT with the exposure 420 s, faint jet-like structure is seen at p.a. 125 degrees and in the opposite direction. The location of the structure turned out close to position of spectrograph slit accidentally. Fig. 2. Fragment of SAO 1-m Zeiss direct R band image taken on 2010 June 10. Bipolar jet-like feature is shown by lines. Dr. Albert Zijlstra (JBCA, Univ. of Manchester) writes that this nebula described in detail by Wesson et al. 2008, ApJ V.688, L21. The extended nebula was found in Halpha images obtained 6 weeks before the outburst as part of the IPHAS Galactic plane survey. The authors describe this object as a planetary nebula connected with the progenitor. An inner knot of nebula increased rapidly in brightness due to flash ionization by nova event. They identified the double emission line near 6723 A as a [S II] lines at 6716 and 6723 A. Possible orbital period. Spectrum development.